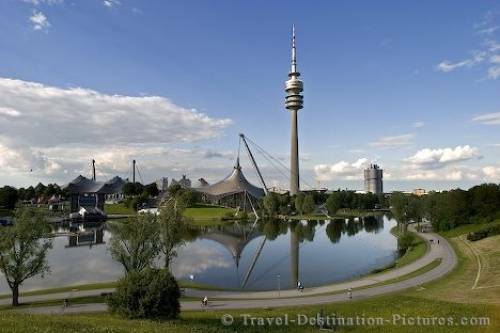 The Olympic Park of Munich, Germany features a lake fringed by a cycle and walking path. In 1972 the Olympic Games where taking place in Munich. For these games they build the Olympia Park with stadiums a lake and a little hill. Since then the park is open for the public and it's worth a walk with the camera. Even from the hill you have a view over the whole city and - with good weather - the Alps in the background. Picture of the manmade lake at the Olympic Park in the city of Munich, Germany.